Oxford, Miss. 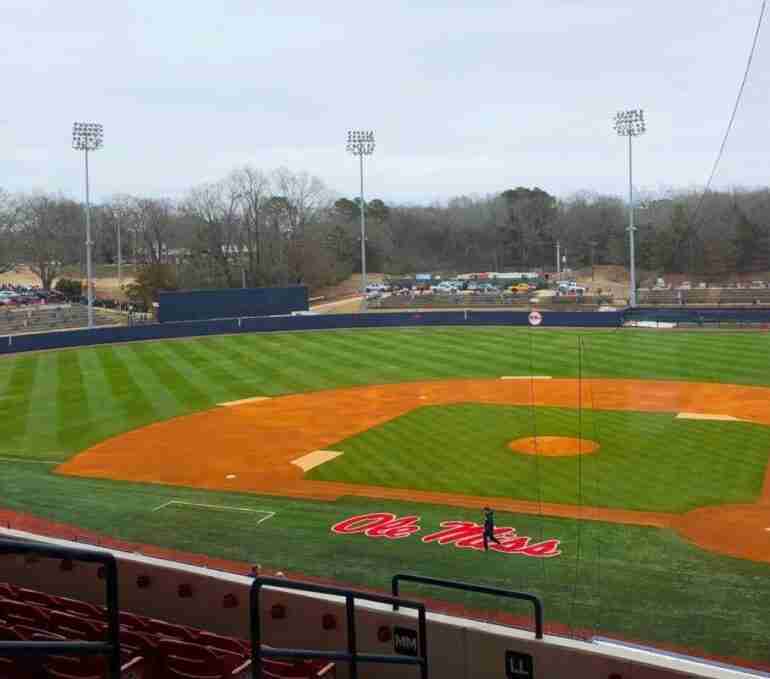 – The 2019 Ole Miss Baseball campaign is right around the corner as the Rebels host Wright State for a three-game series beginning February 15. The first pitch will bring with it the hopes and dreams of fans, players and coaches—including those of a visit to Omaha in mid-June. Tuesday, February 12, is Ole Miss Baseball Media Day, and we will bring you all the latest news and notes from Swayze. But in the meantime, The Rebel Walk has this preview of the 2019 Ole Miss baseball team. The Rebels return much of the potent offensive lineup from last season’s team that finished 48-17. Although they lost centerfielder Will Golsan and catcher Nick Fortes to the MLB, the Rebels return seven of the nine everyday hitters on head coach Mike Bianco’s team—players who hit a whopping 78% of the long-balls in 2018. 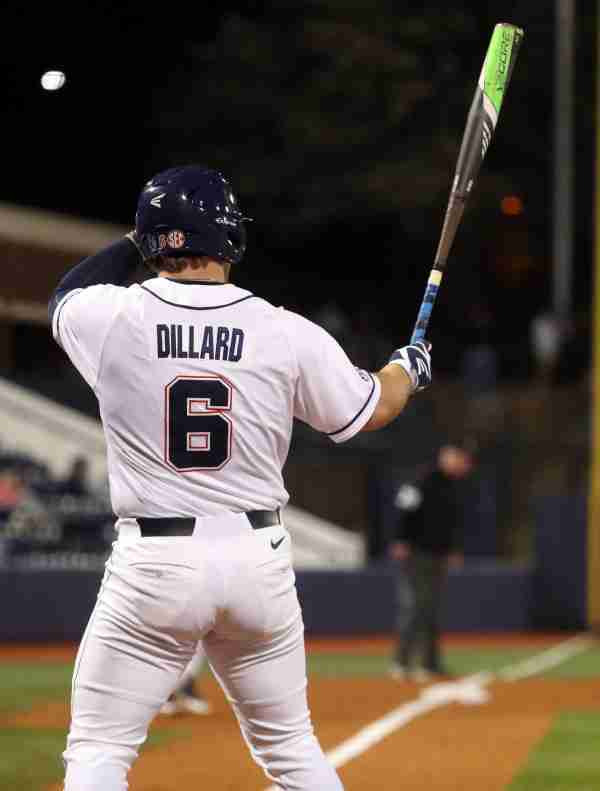 Last year, left fielder Thomas Dillard led Ole Miss with 13 home runs, and this season the junior returns for the 2019 campaign in what will likely be the clean-up position in the order. Also notching double-digit homers last season is junior Cole Zabowski with 10. From a doubles prospective, Ole Miss returns players who notched 100 of the 132 doubles recorded (76%) with senior Ryan Olenek and junior Grae Kessinger tying for last year’s lead with 18. Not surprisingly, Dillard led the squad in slugging percentage (.563) and on base percentage (.439). Other Rebels over .500 in slugging percentage last season included DH Chase Cockrell (.539) and freshman All-American (Collegiate Baseball and Perfect Game) third baseman, Tyler Keenan (.520). Olenek led the team in batting average last year at a solid .350 pace. In fact, six of the seven returners from last year hit .300 or better. This season, at least early on, fans can expect a similar-looking defensive alignment from the Rebels. The educated guesses below are based on last season and from what we’ve seen throughout the spring. Coach Bianco has additional options for the outfield including Servideo, Chase Cockrell, and Carl Gindl. Also, expect Thomas Dillard to see time at catcher, thus providing an occasional spot in left field for perhaps Michael Fitzsimmons or Tim Elko. The MLB Draft was not kind to the Ole Miss weekend pitching rotation. 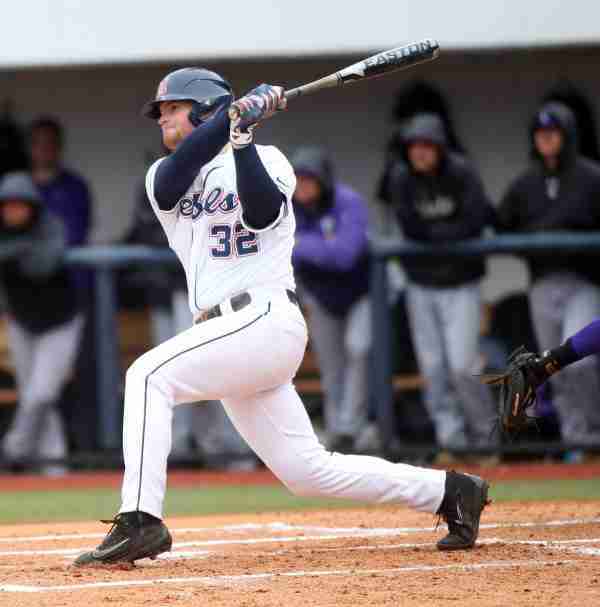 Ryan Rolison was selected in the first round, 22nd overall, by the Colorado Rockies; Brady Feigl went in the fifth round to Oakland; and James McArthur was taken in the 12th round by the Philadelphia Phillies. Fortunately, however, Coach Bianco has many, many talented arms at his disposal. 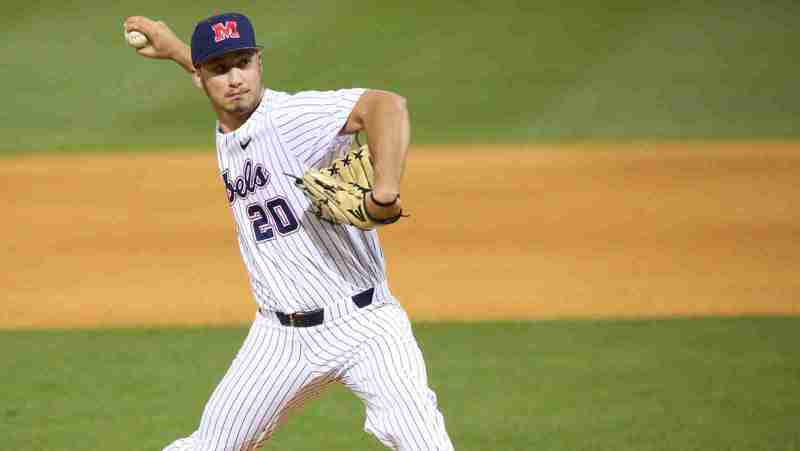 Junior right-handed pitcher Will Ethridge will be the Rebels’ Friday night ace this season. Ethridge made 26 appearances out of the bullpen as a sophomore, finishing with a 3-1 record and a 3.91 ERA (over 50.2 innings). He allowed 22 earned runs on 49 hits. He walked 14 and notched 53 strikeouts. Ethridge, named Freshman All-America by Collegiate Baseball, has been used in relief—including long-relief appearances against LSU (5.2 innings pitched, allowing one run on four hits) and Auburn (6.2 innings, one unearned run and two hits). Junior Houston Roth and JUCO transfer Zack Phillips seem to be the most likely choices for Saturday starter. Roth, also a Collegiate Baseball All-American, started eight games in 2018, allowing 26 earned runs on 55 hits in 52.2 innings while striking out 68. Phillips has truly come on this spring, throwing 64 pitches for 5.0 scoreless innings in Saturday’s intrasquad scrimmage. On Sundays, Rebels could see true freshman Gunnar Hogland on the mound. 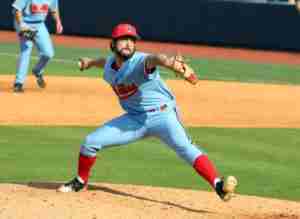 Hogland was drafted in the first round by the Pittsburgh Pirates, but in a move that surprised many, the Florida native opted to attend school at Ole Miss and play for the Red and Blue. While Coach Bianco usually likes to bring young talent along slowly, Hoglund’s talent (a sizzling 0.27 ERA last year in high school) might be best served in the Sunday starter role rather than out of the bullpen or as a weekday starter. 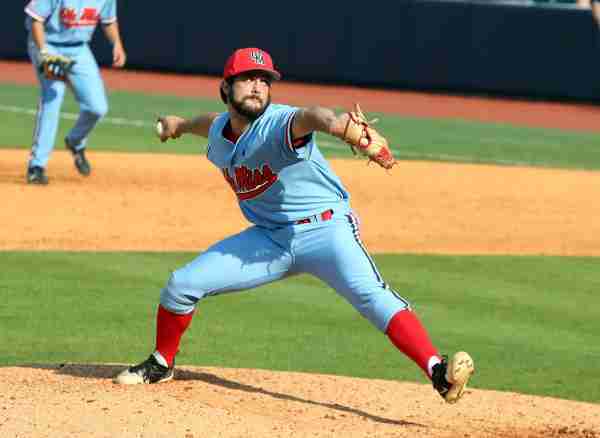 Parker Caracci, the Rebels’ preseason All-America closer, will anchor the Ole Miss bullpen. Caracci’s past accolades include: Second Team All-American Honors from Baseball America and D1Baseball, Honorable Mention All-American from Perfect Game, Second Team All-SEC, USA Baseball Collegiate National Team Member, Midseason All-American from Perfect Game and D1Baseball, and SEC Pitcher of the Week for April 2. If they don’t crack the weekend rotation or earn a midweek starting job, expect to see talented pitchers like freshman Doug Hikhazy, sophomores Jordan Fowler (Freshman All-American from Collegiate Baseball and National College Baseball Writers Association) and Max Cioffi, juniors Greer Holston and Austin Miller in the mix. Keep an eye out, also, for Kaleb Hill, Taylor Broadway, and Tyler Myers from the bullpen. USA Today and Perfect Game also placed Ole Miss at No 10. Collegiate Baseball posted the Rebs at No. 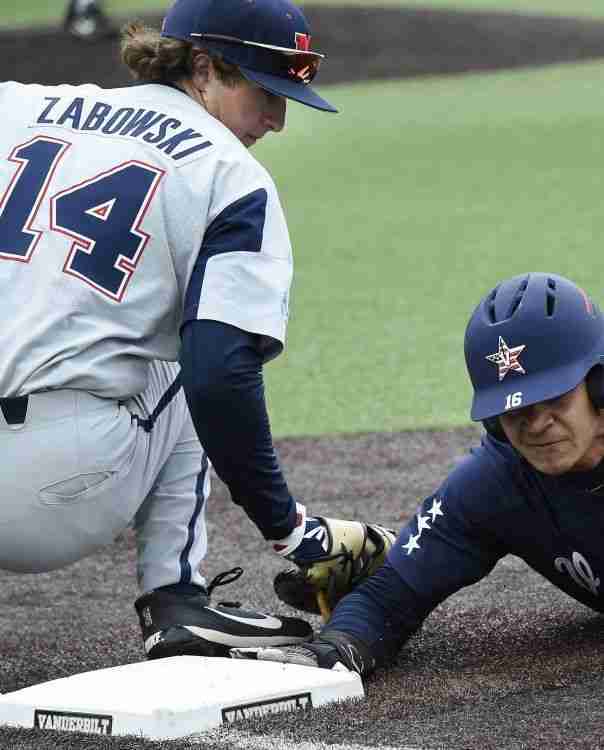 11, while Baseball America slotted the Rebels at No. 13. Last week, Ole Miss was picked second in the SEC West behind LSU by the league coaches. While racking up mid-season and post-season honors in 2018, reliever Parker Caracci has added numerous preseason honors heading into the 2019 season. He was named first team All-American by Perfect Game, second team on both the D1Baseball All-American and Collegiate Baseball lists and placed on the third team Baseball America All-American listings. Additionally, Thomas Dillard earned a spot as a third team All-American from D1Baseball, while outfielder Ryan Olenek garnered third team All-American accolades from Collegiate Baseball. Last week, the league coaches selected Zabowski 1st team All-SEC, with Tyler Keenan, Chase Cockrell, and Caracci as 2nd-team All-SEC. Ole Miss takes the field on Friday, February 15 at Swayze against Wright State for a weekend series. Other home non-conference weekend series opponents include Long Beach State and UAB. The Rebels lone non-conference weekend road trip is February 22 – 24 versus Tulane. Conference action kicks-off at home with a visit from the Crimson Tide. Kentucky, Texas A&M, Mississippi State and Florida (Grove Bowl weekend) round out the conference visitors to Oxford-University Stadium. Hitting the road in league play will be challenging, with trips to play last year’s national runner-up Arkansas, current preseason No. 1 LSU, along with visits to Missouri, Auburn, and Tennessee. Midweek action includes visits from Arkansas State, UT-Martin, Little Rock, East Carolina (coached by Coach Bianco protégé Cliff Godwin), Arkansas Pine Bluff, North Alabama, and Memphis. The Rebels’ midweek road games have them going to Louisville for a two-game Spring Break trip, Memphis, Southern Miss, and Arkansas State. Ole Miss heads to Jackson twice for two annual neutral-site games: the first against Southern Miss and the second versus Mississippi State. During fall camp, Coach Bianco announced that senior Michael Fitzsimmons will be the Rebels’ solo captain for the 2019 season. Fitzsimmons played in 24 games in 2018, hitting .440 with three home runs. We will bring you all the latest info from Tuesday’s Ole Miss Media Day.